I am now officially a self-published author! If you can recall or if you follow this column, I wrote last January 30 of this year that I was in the process of writing my very first book. And now it is finally out there in the world! To recap, this was a journey which took 10 years, when I decided at that time to publish a book! I am a content creator for that long already, oh how time flies. It was a messy path I took, with not sure what to write until I figured to start with this topic of “Lazy Investing”. Why be a Lazy Investor? Because we don’t like friction in our lives. We also can’t predict the direction of the market. No one can. Simplicity, it’s what we all want to achieve in every area of our life. 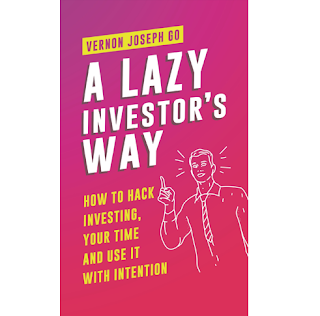 "A Lazy Investor's Way" is for anyone who wants to use time & money well. And to focus on what matters most in life. • Identify and start changing self-sabotaging beliefs and behaviors that stop you from getting what you want. • Act-on self-awareness, perspective, patience to help you create the life you want. And create it NOW. • Realize your potential and purpose while building your own path to personal and financial success. Anything else? Oh, this could also be the key to your future and maybe your happiness! Believe it or not, it doesn’t take a lot of money to self-publish a book with the power of the internet! • Through Amazon, I spent zero on ISBN for the paperback version of the book. • Zero spend also for ebook publishing and distribution. And that’s about it for now. I have not yet decided if I should buy my own copies at cost to give away to my friends for free. I have not also spent any distribution expenses such as Amazon or Facebook advertising. But this could still change later though. For now, I ‘ll utilize all the free distribution tools and the like marketing at my disposal. Special mentions and thanks to the following for helping me out on this. Thank you to the divine being above that somehow, silently watches over me and my adventures. To my parents, my sister Vanikha Go, Donna Melgar and extended family. Who provide love & support for the random things I keep doing without their permission. To the wacky gang at Cebu Content Creators and also to Attorney Zigfred Diaz for introducing me to the world of Personal Finance and Investing. To all my friends who also shared their support and encouragement. To Razilee Ligaray, Mariejo Sevilla, Johanna Marie Frejoles for your timely reminders that I had to finish this book. To the beta-readers, Selah Marie Labay, Noreen Barrita, who shared their feedback. Also, to Maria Jessa Sepe and Vernie Naraja for allowing me to use your words. To Camille Marie Marcon, Lorbe Catadman for your editing advice and Aldrin Jake Suan for the wonderful cover design!